Kent Apartments provides clean, comfortable, affordable off-campus living for students at KSU. 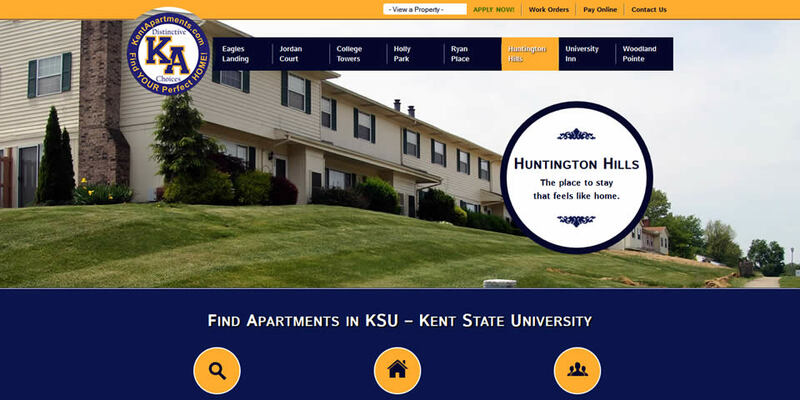 Kent Apartments is one of the most prominent college apartment rental companies serving students of Kent State University, with eight expansive rental campuses in Kent, Brimsfield and Stow, Ohio. Their previous site did a poor job of presenting their value and quality, was difficult for visitors to operate and was difficult for administrators to maintain. Kent Apartments had specific needs that went well above updating the site’s look and feel. They needed their apartment search function rebuilt, a better functioning intake process/forms and responsive/adaptive design for optimal mobile browsing. In addition to these features, we built an intelligent home page slideshow that switches displays based on the property selected, and we built robust tools into their content management system (WordPress) to make property-specific information and apartment search functionality easy to maintain.